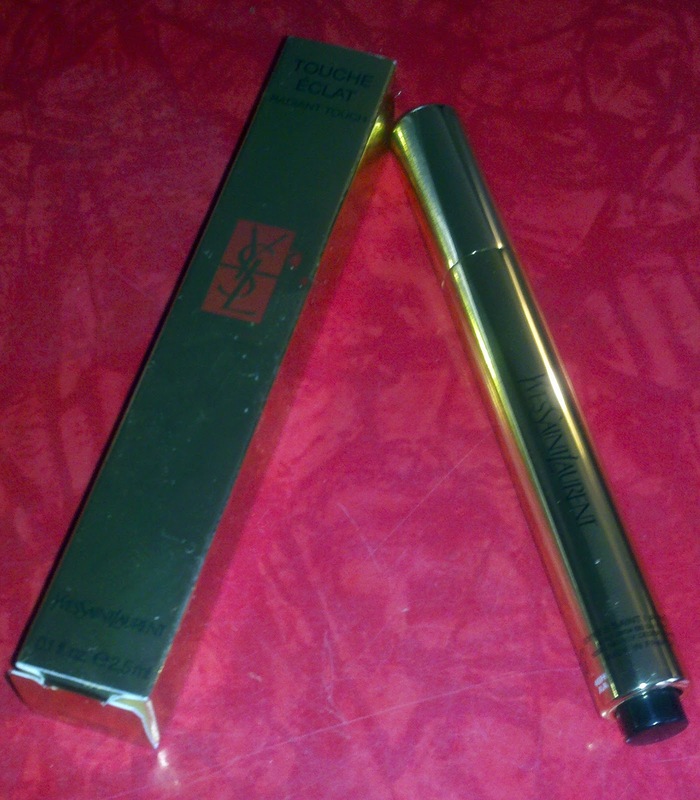 THE SKINNY: The claim on Sephora’s website is that the YSL (that’s the industry slang for Yves St. Laurent – I like feeling like an insider) Radiant Touch brings “light and radiance to the skin, immediately erases signs of fatigue and brightens the complexion.” As a girl whose dark circles around her eyes can only be compared to a raccoon on a bender, I was willing to try anything. I have found that Jackie O sunglasses are the best concealer, but unless I’m impersonating Karl Lagerfield, I can’t get away with wearing them indoors. At night. I needed to find a different solution. I was extremely hesitant to fork over $40 for what amounts to a Sharpie, only in prettier plastic. For that price, I could buy Lagerfield’s glasses! I was pleasantly surprised (shocked, rather) to find out that it works. It actually works! The application couldn’t be easier, just a press of the button on the bottom of the pen and it deposits a small amount of luminizer on the bristle tip. The creamy texture makes it easy to blend without tugging (what lady wants to tug on the eye area?) I’m not sure how YSL does it, but the highlighter manages to disperse light and make the dark circles disappear. I look as well rested as if I’d gotten 10 hours of sleep at a luxury resort in the Turks and Caicos. Without the kids. And with a venti Starbucks. In addition to hiding the hungover raccoon who’d gone 10 rounds with Mike Tyson look, a little YSL on the tops of the cheekbones really makes them pop. It helps define the lip area, which makes my red lipstick look even better! No mere Sharpie can claim this kind of magic pixie dust! KEEP OR TOSS: Keep! I will not leave the house without this stuff. You will catch me without lipstick before you catch me without YSL and for a lipstick junkie, that speaks volumes. Yes, it is pricey, but a little goes a long way – one tube lasts for months. This is as close to a supermodel as I’ll ever get and I’m good with that! Now if you’ll kindly excuse me, I have a catwalk to strut. CHECK IT OUT: For application tips, shade finder and shopping visit YSL online (and they offer free shipping on everything).